We are a leading Authorized Retail Dealer of Spiro Win, Peri Win ABI, Spiro Win Plus, Dicro Win C, Diabetes Risk Profiler and Cardiac Risk Profiler from Hyderabad, India. 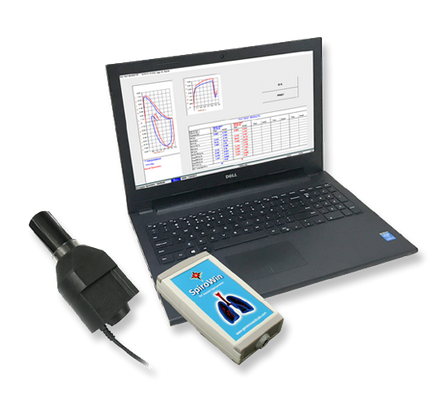 SpiroWin is a Windows based Spirometer. computes 22 parameters. with Online Real time Expiration and Inspiration graphs on screen for all tests. Printouts include FN. V/I. SVC. and MVV graphs. Extensive patient database helps you keep track of patient his., and other exhaustive information. Multicolored test report on A4 size paper.. any color printer. Capable of more than M. patients memo, All at your mouse click in a very user-ffiendly Sp win sof.are. SpiroWin has a unique feature motivate patients give their best exhalation. When you input the rekvant patient data. the screen changes FVC test. Instead ofpredicted values being displayed. A Water tank is seen. All you have do is ask the patient exhale such that the tank is completely filled with water. in the process of doing this you get the maximum performance out of the patient. PeriWin_ABI is state-of-the-art PC Windows* based fully automated ABI (Ankle Brachial Index) analysis system with Pressure waveforms and Interpretation. PeriWin_ABI uses automatic simultaneous limb NiBP Mon-Invasive Blood Pressure, measurement of all four limbs. It automatically calculates Ankle brachial Index of both Right and Left lower limbs. Additionally. it incorporates Oscillometric envelop.. These Index are established as independent madrers of peripheral atherosclerosis. PeriWin_ABI also calculates mean Arterial Pressure 6 Pulse Pressure of all limbs. All these parameters give a complete picture of peripheral vascular ftinction of the patient. It is a very useful tool for prevention. detection. treatment and follow up of Peripheral Arterial Disease WADI. Windows. based PeM.Vin_ABI software 6 USB port communication with the handy Periwin_ABI instrument toms any PC in. a .11-fldged Ankle Brachial Index Analysis system. with online real time graphs on screen. It gives a multicolor/ B6W one-page report on /14 size paper. In-built patient database with more than 1000 patients memory helps keep track of patient histor, All at your mouse clic. in a very user-friendly PeriWin_ABI software. SpiroWin+ is state-of-the-art PC Windows* based Pulmonary Function Analysis System with interpretation. The system conducts FVC. SVC. MVV and Branch Degree Provocation Chalknge tests. It gives exhaustive information in terms of vafious parameters and an accurate interpretation. It can analyze both Medication and Provocative Chalknge responses of the pulmonary system of the patient with maximum possible ease of operation. SpiroWini- sofbeeare provides with Automatic / manual best test selection, detailed printing of FN. eft. broncho-challenge response graphics. post analysis with overlapping of to pertormed in different test sessions. Seven pre-defined and one user definable predicted values etc. Windows. based SpiroWini- sofbeeare 6 USB port communication with the handy SpiroWini- instrument tums any PC in. .11-fledged Pulmonary Function Testing. with online real time graphs on screen. It gives a multicolor / B6W three-page report on A4 size paper. In-built patient databaseUnique patient incentives for adult and pediatric patients help the patient undergoing pulmonary tests achieve maximum effort . with more than 1000 patients memory helps to keep track of patient history All at your mouse clicks in a very user-hiendly SpiroWini- sofbeeare. DicroWin_C is a PC Windows* based PPG (Pulse Plethysmography) Analysis system, useful for various disciplines of medicine viz Pharmacology, Cardiology, Physiology etc. OkraWin is useful for study of Vascular Flemodynamics. Evaluation of Vasoactive drugs on Vascular Hemodynamics. Arterial Compliance. Arterial Stiffness Studies. Detection and follow up of Arterial diseases and Blood Flow analysis. Windows^ based DicroWin sofbeeare 6 .13 port communication with the handy DicroWin instrument tums any PC in. a fledged PPG Analysis system. with online real time graphs on screen. It gives a multkolor I36W one-page report on A4 size paper. In-built patient database with more than 000 patients memory helps keep track of patient histor, All at your mouse clic. in a very user-biendly DicroWin software.